What is Kindergarten Readiness and Why Does it Matter? In the years leading up to a child’s first formalized schooling experience, parents play an important role in laying the foundation for future schooling success. With kindergarten being required in 30% of all states and 52% of all states requiring a Kindergarten Entrance Exam, making sure children have the cognitive skills to prepare them for kindergarten is an important step in ensuring early literacy success and continued development. A picture of some children in our Family Literacy Program! They are posing with puppets they made during the FLP session. “Kindergarten readiness” is a term that outlines what many education experts tend to agree will help a child succeed in kindergarten. 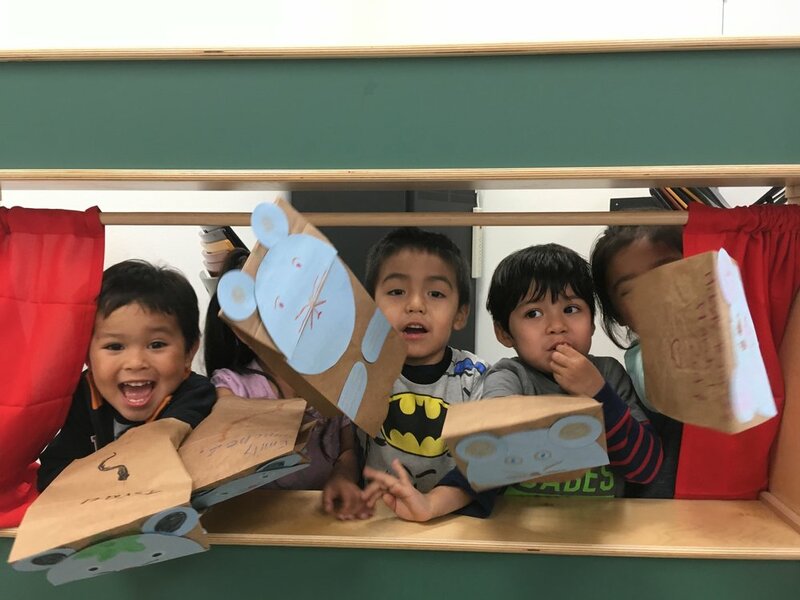 With kindergarten being the first schooling experience for many children, it is important that they are comfortable, confident, and eager to learn in the classroom in order to set the tone for what the next several years of their life will revolve around: school. Identify major characters, setting, and basic plotline of a story. Recognize different types of text, including poems and storybooks. Recognize what an author's and illustrator’s roles are in a book and how to identify them. Identify the parts of a book including the front, spine, and back. Understand the way in which we read and write: From left to right, in strings of sentences, and spaces between words. Identify the letters of the alphabet and the sounds they make. By understanding what your child needs to know by the end of their year in kindergarten, you can work backwards, determine where the biggest gaps are, and ensure that your child is prepared for school. How Can You Help Your Child Become Kindergarten Ready? As summarized in the “Early School Readiness” report by Child Trends, the following four skills are indicators of early literacy and cognitive development: ability to recognize letters, count to 20, write their first name, and read words in a book. While these are not an official or universally agreed upon measure for determining if a child is “kindergarten ready”, these competencies appear to be referred to most frequently in literature surrounding the topic and they are also supported by the Common Core Standards. Children in our Family Literacy Program practice skills like counting, rhyming, and color recognition by participating in fun activities! Practice reading/writing the letters used in their name. This helps develop both the motor skills used to hold a pencil and their familiarity with the alphabet. Start counting with them. This can include animals in a book or carrots on their plate. Focus on incorporating numbers and counting into their daily life. Point out numbers that surround them. This can be page numbers, office numbers, road signs etc. Expand their vocabulary by using diverse language during conversations. Marianne Hillemeier, PhD, completed a study on 8,700 two year olds and the amount of vocabulary they knew. Those who used more words at age two had better math and reading skills and fewer behavioral problems when starting kindergarten. Teach them about books -- the front, back, spine, and how we read from left to right. This initiates a knowledge of books and prepares them to read books themselves. At Words Alive, we understand that parents are their child’s first teacher because they have the best opportunity to prepare them with the tools needed for success in school. Our programs at Words Alive not only aim to instill reading and literacy habits in young children, but we also hope that parents leave our programs with the foundation and motivation to build these habits at home! Learn more about our Family Literacy Program, in which we teach parents how to prepare their children for school and introduce literacy education into their homes, by checking out this page. If you are interesting in supporting these efforts, please consider donating here.